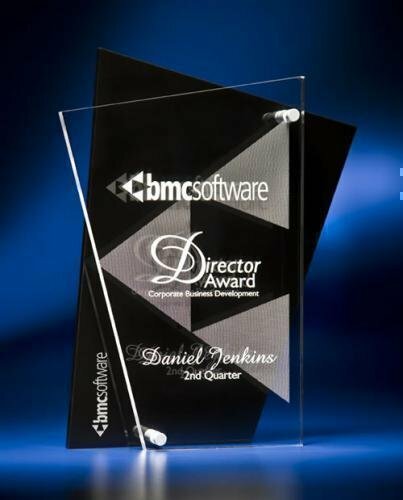 This stunning acrylic award features a black back acrylic piece with a front clear acrylic piece held together by satin silver pins creating depth and perception in the final award design. 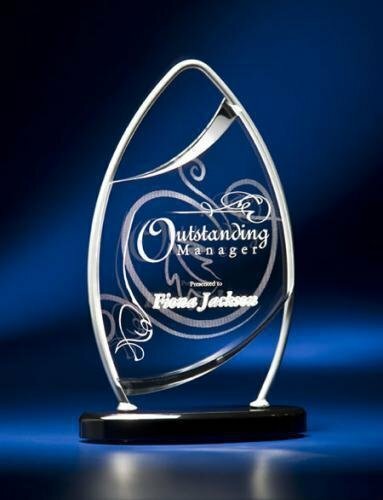 Full color imprinting on the clear portion of the acrylic piece available as an optional imprinting method for this award. A stunning combination of bent satin finish wire frame holding a stunning acrylic shape angled in the circle resting on a black acrylic base. Full color imprinting available as an optional imprinting method for this award. 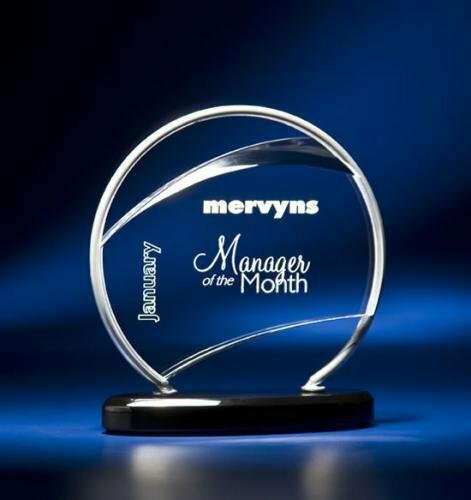 A beautiful combination of clear acrylic silk screen with a black accent area complimented by a wooden base complete this elegant acrylic award. Laser engraving to a frost white color. 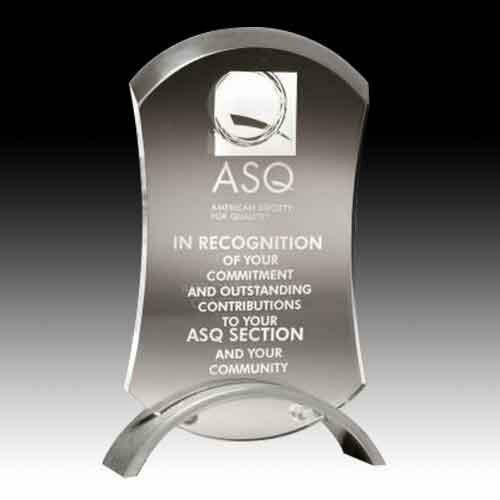 Full color imprint also available on the clear portion of this award. 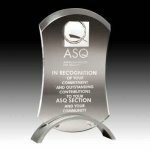 Clear and black acrylic award with a circle cutout. Designed with outstanding care an craftsmanship. 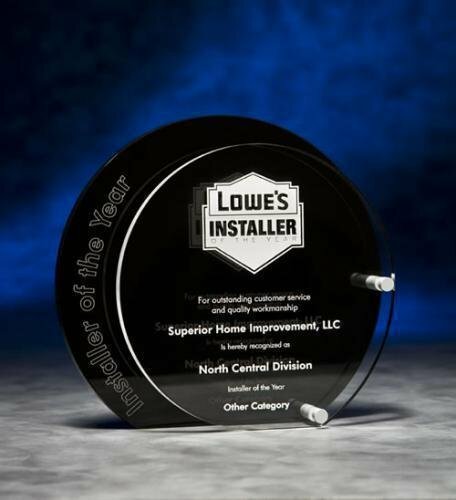 Full color imprinting on the clear portion of the acrylic piece available as an optional imprinting method for this award. 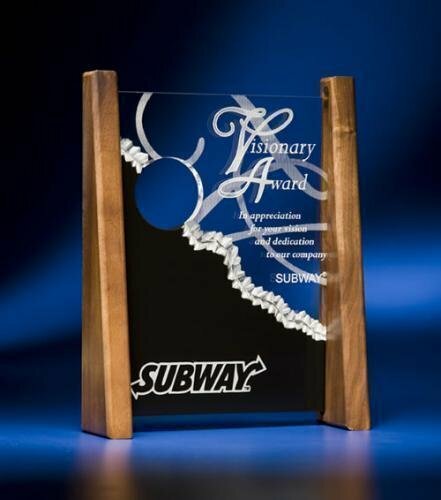 Clear and black acrylic award with a circle cutout accented by wood side pillers. Designed with outstanding care an craftsmanship. 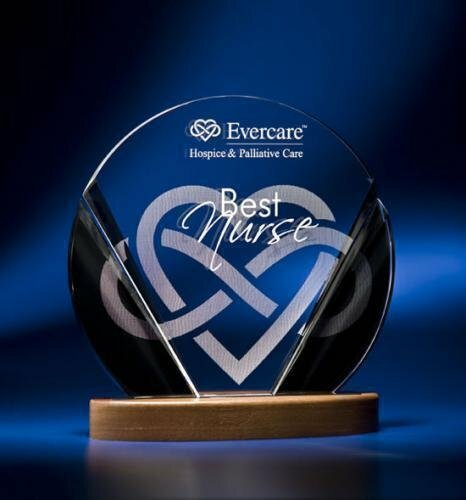 Full color imprinting on the clear portion of the acrylic piece available as an optional imprinting method for this award. 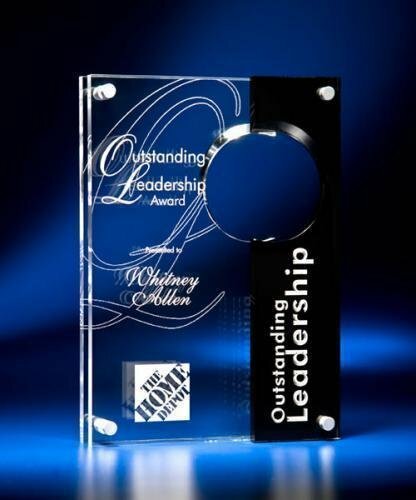 A Stunning clear acrylic award design accented with a silver colored arched base. Full color imprinting available as an optional imprinting method for this award. 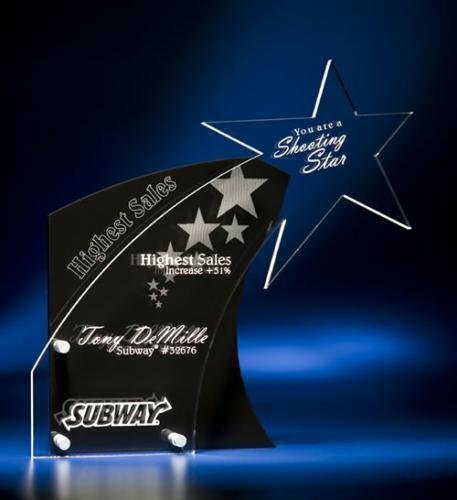 This stunning star acrylic award features a black back acrylic piece with a front clear acrylic piece held together by satin silver pins creating depth and perception in the final award design. 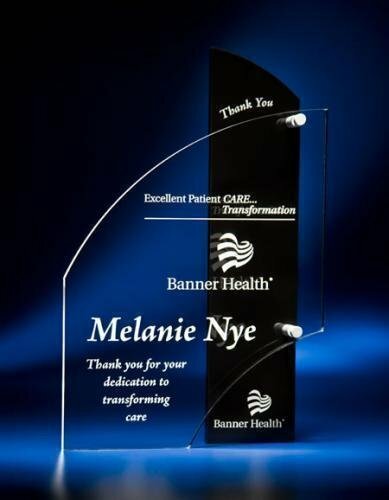 Full color imprinting on the clear portion of the acrylic piece available as an optional imprinting method for this award. A stunning combination of bent satin finish wire frame holding a stunning acrylic shape angled in the pinnacle resting on a black acrylic base. Full color imprinting available as an optional imprinting method for this award.